WELCOME teachers, students, librarians, parents, and other children's books lovers to our BLOG BLOG (Book Lovers' Online Gallery BLOG) - a great source of book reviews created by Children's Literature Professor, Deb Marciano and students in Elementary Education. Let us know what you think! HAPPY READING! CONGRATULATIONS AND THANK YOU FOR YOUR CONTRIBUTIONS TOCHILDREN'S LITERATURE! Overview: In this bilingual conversion of English and Spanish, meet Rosa Maria in her tiny little house and spend every day of the week preparing for a birthday party extravaganza! Learn how to make a birthday cake, fresh lemonade, enchiladas, rice and beans, and a piñata for this family celebration that truly shows how big the heart can be. Be careful, though, not the let the mice get in the way. Overview: Baking warm, sweet apple pie requires many ingredientsBut, OH NO! The market is closed! That’s okay, travel the world to get fresh ingredients! When you come home you will have warm pie and great adventures to share with friends and family! Activity: If your kids like this picture book, surely they would enjoy Hot Air, which is also written by Majorie Priceman. A template for a picture flip book that illustrates the main events of this book would be a fun activity for the children to do after reading it. Overview: Learn how Mrs. Biddlebox turns her bad day around just in time for a warm supper and a good nights sleep. With a good attitude and a little bit of magic, you too can turn around a bad day! 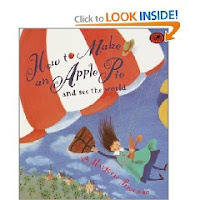 Activity: Children can brainstorm the “before and after” of this book? 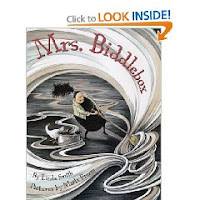 What do you think happened that made the day to horrible for Mrs. Biddlebox, and how do you think her next day went? Overview: From the author of New York Time’s Bestseller, Coraline, this picture book, perfect for Halloween time, combines spooky illustrations with a spooky tale. 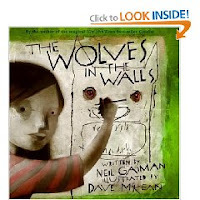 What happens to the house with wolves in the wall? And the family that lives in it? Read and find out! Activity: Around Halloween, this book could be read in order to spark imagination to write a spooky story. Overview: This cumulative story retells the unfortunate events of a little girl who misplaced her library book on the day it is due! All day Stella Louella frantically searches for her book, which has been picked up, read, and placed in many different places! 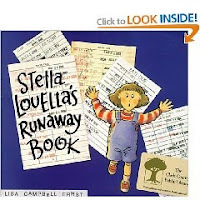 Will Stella Louella find her library book in time to return it to the librarian? Find out! 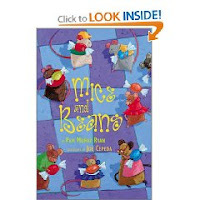 Activity: This is a great book to read to Kindergarteners before they begin using their school library. Or-jumpstart a discussion about responsibility, and what else in our lives we need to be responsible for. Overview: Caldecott Medalist Paul Gobel re-tells the Plains Indian folk tale of Iktomi, which is a Sioux name meaning spider. In this story Iktomi goes out to hunt for food. He sees red berries in the water, wants to pick them to eat, but can’t figure out how to get them out of the water. Iktomi must continue to try to get the berries to take home to his family. There is a great lesson at the end of the story. 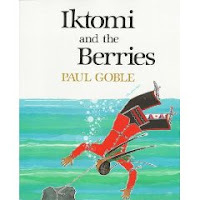 Activity: Students can draw a picture of Iktomi trying to get the berries out of the water. 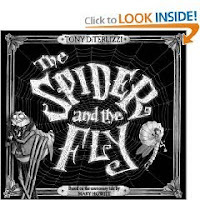 Overview: A haunting tale, based on a 1800’s poem by Mary Howitt, about a devious spider who coerces an innocent little fly into his parlor of no return. The illustrations in black and white provide details about the story that would not otherwise be known. Activity: This fable could be used around Halloween, as a light horror story. You could then have students write their own horror story. Have students share their stories with the rest of the class. Overview: Paintings in the form of a comic strip, help tell the tale of Philippe Petit, the man who walked between the Twin Towers. He secretly planned his walk despite the odds against him but paid the price for his actions in the end. In this story, Petit is remembered as a legend for his courage to do the impossible. 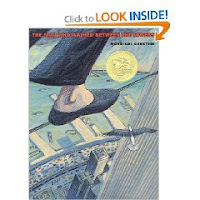 Activity: Have students pretend they took the walk of Philippe Petit on the wire. Have them write a poem from their perspective, about how they would act and feel on that cable high in the sky. 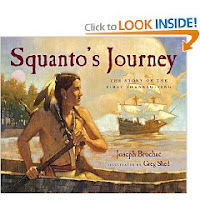 Overview: A story about Squanto and his interactions with the English settlers. While he encounters hardships and triumphs, he is able to become a peacemaker between Indian tribes and the English, and eventually they are able to indulge in Thanksgiving together. Activity: Have students write a thank-you letter to Squanto, for keeping the peace and for creating the first thanksgiving. Then have students write cards to others whom they are thankful for. Overview: One day a young native American girl gets lost in the wilderness with a herd of wild horses and loves living with them. 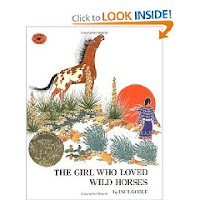 A few years later hunters find her, and she goes home to her parents, and realizes that she misses being with the wild horses, so she goes back to live with them. In the end she lives forever among the horses, where she belongs. Activity: Incorporate this story with a lesson about Native American culture. Have students write their own Native American legend. 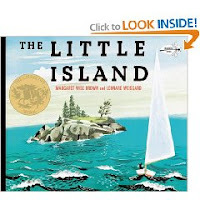 Overview: The little island in the middle of the ocean experiences the many changes of the weather and seasons. This little island is quite big to all the creatures that live on it. The beautiful watercolors along side the poetic text, helps to paint a clear picture of the island in the readers mind. 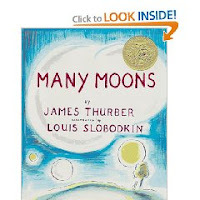 Activity: Have students take a sentence or two from the book and draw a picture to accompany the text. Take the completed work and make a book out of it. 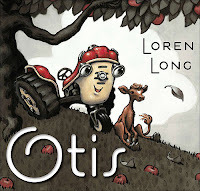 Overview: Otis is an old rundown tractor who is replaced by a big new yellow tractor, and is put into misery when he is left outside because he is no longer of use. But when his friend, the young calf gets stuck in the mud, he is the only one that is able to get her out. Activity: Have students think about how Otis helped out the calf. Have them come up with a list of thing the can do to help out others in the classroom. Post this list somewhere as a reminder of what they can do. Overview: Princess Lenore was feeling ill and told her father that in order for her to get better he would have to get her the moon. The King sought out many different members of his court to get the moon, but they all claimed that it would be impossible. The princess is tricked into believing that she was wearing the moon around her neck, so now the real moon needs to be hidden from the princess. Activity: Have students discuss what one thing they would wish for in the entire world. Have them write about how this wish would be granted or why it wont be. Look How Many Readers have Visited!